Combine flour, butter, sugar, salt, and zest in a food processor and pulse until most of mixture resembles coarse meal with remainder in small (roughly pea-size) lumps. Add yolks and process just until incorporated and mixture begins to clump. Turn mixture out onto a work surface and divide into 4 portions. Smear each portion once with heel of your hand in a forward motion to help distribute fat. Gather together 2 portions of dough and form into a ball; make another ball with other 2 portions. Pat out each ball of dough with floured fingertips into a tart pan, in an even 1/4-inch layer on bottom and up sides (about 1/8 inch above rim). Chill 30 minutes, or until firm. Stir together sugar and cornstarch in a large bowl. Add plums and lemon juice and toss to coat. Let stand, stirring occasionally, 30 minutes, or until juicy. 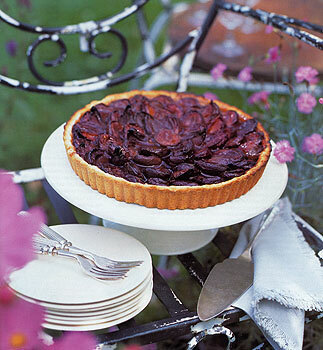 Arrange plum halves, skin sides down, in tart shells, overlapping in a rosette pattern (see photo, opposite). Halve any remaining plums lengthwise and randomly tuck in between plum halves in tarts. Pour all juices from bowl over plums. Bake tarts in middle of oven 15 minutes, then reduce temperature to 375°F. Cover tarts loosely with foil and bake until plums are tender and juices are bubbling and slightly thickened, 40 to 50 minutes more. Brush warm juices in tart over plums. (Juices will continue to thicken as tarts cool.) Cool tarts completely in pans on a rack. • Tart shells can be made 1 day ahead and chilled, covered. •Plums may stand, coated with sugar, cornstarch, and lemon juice and chilled, covered, 1 day. Stir well before proceeding.